Well I get A LOT of emails asking for help with a variety of Meyer plow problems, and questions. I thought maybe sharing them here would benefit others, so here they are. This is just a couple of months worth, I will add more as time allows. I got a 95 F350 with a 9ft meyers with an E-57 pump on it. During this last big storm be all got on the east coast, my touchpad all of a sudden showed up that the overload light was on and the plow would not respond to anything. I replaced the solenoid for the plow motor but nothing happened. I did get the plow to lift up once after the truck sat for overnight. Then I got it to angle left but will not do anything else from there. I ordered two new coils from you guys to install on it to see if that fixes the issue but maybe this is something you guys would know exactly what it is and could shed some light on it for me. I also wanted to compliment you guys on your online part store. Everything I will ever need for my plow you guys have and response is very fast. Thank you again. Not sure if I spoke to you today, maybe I did? I had a very similar call. IF I did, I am just going to say what I said earlier on the phone. The overload light comes on when the touchpad senses a high amp draw either on one of the coils (A, B, or C) or the motor solenoid under the hood. It could be that one of these is failing, or that there is a bad connection, or the wire could be overheated either in the harness or the actual lead on the coil. Black overheated wire creates more resistance, which increases the amp draw. If you hit down and the red light comes on, then check the black wire to the A Coil. If the red light comes on when raising, check the red wire going to the B coil. If the red light comes on when angling right, check the green wire going to the C coil. If the red light comes on when angling left, check the white wire on the motor solenoid under the hood. IF the red light comes on with all the functions except lower, I would cut the ring terminal off the white wire at the motor solenoid, and strip the wire to put a new end on, and make sure that wire is not black inside the insulation. Finally, if all these things check out OK, and the touchpad is the old square flat face (no raised buttons) and the buttons say U, D, L, R on them, the touchpad is likely on its way out. First off, thanks for putting together such a great site with so much information, it has helped quite a bit already. Now for my question- I have a E-47 with a 9 ft blade from a municipal set up that was new in 88. The pump will raise the plow with assistance (snow pile or even by hand) and hold but can not lift the plow on its own any more. The angle rams work properly and hold with out any assistance. Any guidance you coud provide would be greatly appreciated and the parts will be ordered thru your site immediately after. If it is easier for you please feel free to call xxxxxxxxxx any time day or night. Without a pressure gauge, it is impossible to say what is going on. It sounds like a warn out pump, but it could also be a bad pump relief valve, or be out of adjustment. site or in the Meyer PDF. think my year is 1983. There is no metal washer under the wiper. My guess is the old wiper broke into two pieces. That is why there is no mention of a washer anywhere. Yes, on the older units the hole in the top cap was smaller. No harm in making it larger like the newer units. You rebuilt an E47 for me about a month ago. I don't want to take up any of your time with something that is probably just me being paranoid but-I am hearing a strange "groaning" noise during the last couple inches of lift-never on the angle cycle. The problem is intermittent-I did unhook the chain once while it was doing it and it still made the noise. I noticed it during our first storm a little over a week ago-along with the noise it would go really slow the last couple of inches. Couple of days later the motor died. I bought and installed a new Meyer OEM motor and upgraded the power cable to 2 gauge. Speed is even better than ever-its just that groaning noise once and awhile. Voltage at the battery with/without load is good along with voltage reaching the motor. I'm sure it's just me being paranoid-but don't want to be harming my like new pump and motor. If you have any ideas let me know. I also started a thread on lets talk snow to see if any of the guys have any ideas. Thanks for your time and really appreciate the great job with the pump-it works FANTASTIC and faster than ever-best of all no more freezing fluid. Thanks again. It is not unusual. That is when the pump is working the hardest, and the relief valve opens on the pump as it maxes out. Angling takes no real force as there is no resistance. Lifting does, and at the top of the stroke is the most resistance. You can also try spraying the top mounting bolt and bottom mounting bolt with Fluid Film or spray grease, as it may be adding to the noise as the pump pivots on the bolts with the full load on it. I would not worry about it. The pump was putting out 1650 psi, right on spec. I was a little surprised that the motor died, as the amp draw was good here on the stand. Not sure on the age of the motor but that pump is a 1981 model year. Message: I have a Meyer E-47. drained old fluid and replaced with new. Also drained rams and replaced all couplers with pin type. no leaks. The rams movement hesitates and seems slow now and the plow can now be moved easily side to side by hand. Also looses angle now when plowing. i have cycled the plow up, down and side to side numerous times to circulate fluid and bleed any air. Fluid level is good. Any help would be appreiated. Mushy = air in rams. You need to get the back end of the angle rams higher than the front end. IF the fittings on the angle rams come out the side it is even harder to get it out. Our driveway here at the shop is a pretty steep hill. We back the trucks up the hill, and stop on the hill, and angle the plows back and forth to get the air out. Worst case I had was a Ford Ranger, I had to drive it up on a set of ramps to get the back of the rams high enough to bleed the air out. If you changed the Pilot Check Valve, and the Crossover Valve, checked the C Valve O Rings (or replaced the C Valve) and still have the problem, replacing the PA Block is the answer. The C Check Valve is installed in the PA Block, and a steel ball is pressed into the cavity to seal it. So it is not serviceable. That is the reason the PA Block would need to be replaced. I am plowing out of Atlantic City,NJ. My plow is about 5yrs old. I have it serviced every year at seasons end. This year it has been acting very strange. The plow motor will continue to run after the signal has stopped. I will get a �red overload� signal on the Electro-Touch Pad. For some reason the starter solenoid is sticking open and continues to feed the pump power. I have replaced almost everything on the plow. New solenoid, new joystick harness, new power cables, A,B,C solenoids have been tested, cross over relief valve serviced and the inline fuses are good. My mechanic and I are completely stumped. The problem only occurs every two or three angles. Sometimes when it occurs the plow will kick to the left but not always. It is very frustrating. Any tips you can provide would be greatly appreciated. You say you have a touchpad, but then you say you replaced the joystick harness. Which controller do you have? If it is the touchpad, it sounds like the touchpad is bad. I have the Touch pad. I was troubleshooting by removing the touch pad and harness. I actually resolved the issue today. There is an issue with some truck alternator/batteries sending 13/14 volts to the solenoid. Meyers has a small diode that can be attached to the solenoid (with the white controller wire) and then grounded into the chassis. The diode dissipates the extra volts into the ground. The diode has been standard with all controllers for over a year. We have installed them on all new installs. At service school, we were told that the diode prevents the motor from sending power back to the controller and frying it, beause as the motor winds down after running, it is possible for it to send a spike back to the controller. Interesting that it solved your problem. "The diode is to prevent power from backfeeding to the controller. I do not understand how this would cure his problem." I recently got an old snow plow (Meyer ST-78) and am having some complications in more than one area. First the pump, the motor works but is very loud and pulls a ton of power from the battery to work. I would assume it either needs some serious work or replaced??? Also is leaking fluid near the bottom where the release lever is. Also having troubles attaching to truck. I have an old Ford F150 1978. The plow looks like someone custom welded the hook up mounts for the plow and for the bumper. The problem is the truck has a lift on it and when put on the brackets on the truck had to be lengthened. All was fine until a heavy snow and when used bent the brackets. Is there any actual mount still sold for a model this old and if not any great ideas. I live near Boise, ID and was wondering if there is a dealer in the area. Any help would be great. The ST-78 was made to fit 3 vehicles.... The Jeep CJ, the International Scout, and the early 70's Bronco. Meyer did not make any other mounts for the ST-78. So you are on your own as far as having it on a 1978 F-150. It is too small for the 150, so there is no mount available from Meyer for it. Guessing that since you are talking about a leak near the release lever it is a T-5 or T-6 pump, which has been obsolete since the early 1970's and there are NO parts available. The motor however is just an old Delco starter motor, which I am guessing could be rebuilt, or if brought to an electric motor shop, possibly replaced. They were available in both 6 volt and 12 volt, too. Your money would be better spent on a rebuilt E-47 to replace the T series. Parts are plentiful and readily available for the E-47. The M15254 E-47 Basic Seal Kit includes the lift ram packing cup (it is not leather). The only difference between the M15254 E-47 Basic Seal Kit and the M15456 E-47 Master Seal Kit is the Master Seal Kit comes with all the valve O Rings, (A, B, C, Crossover) and the Pump Shaft Seal. IF you are searching for an A solenoid, you will not find it because it is called a coil. You want the 3/8" A Coil. Sabre lights with the appropriate modules for the 1994.
thing) is frozen/rusted solid into the mount that went onto the frame. There is no getting it out, save for torching or cutting. the E47H so many times, I know it like the back of my hand. The tubular lift frame is universal. A new one is $550. Once the mount is off the truck it is a little easier to get it out. I tried once with a 2.5 ton floor jack, and no luck. Then I switched to a 20 ton bottle jack and was able to get the frame to pull out a 1/2" at a time. Move to the other side, 1/2" move back to the other side, etc. I did not need a torch. I can imagine some would need a torch to warm the tubes. I have had other customers that cut slits in the tubes with a 4" angle grinder, and they got the lift frame out that way. The Nite Saber headlight modules are universal, only the headlight adapters are headlight bulb specific. The control harness, power and ground are universal. So you need to get the lift frame out, buy headlight adapters, and the 17138 mounting carton to make it work. If you can't find a used 17138, new is $850. The A Valve controls down. It could be bad. As far as not going up and fluid leaking out at the top, it sounds like the Lift Ram Packing is shot. All you would need is an E-60 Basic Seal Kit. The manual has step by step rebuilding instructions with pictures. Only you can decide if it is something you want to tackle yourself. 2) Is the $350 cash back offer still in effect on the 7'6? 4) What do we need to do to get started? The Meyer Drive Pro 7'6 is the only acceptable plow for your F-150. The Cash Back offer expired 12-10-10. Your truck must have a 4300# Front GAWR, and have the Ford plow prep package for us to install a plow on it. IF it does not have a plow prep package, and a 4300# front axle, we will not install a plow on it. We do have a couple of the Drive Pro 7'6 plows in stock, but we do not have the mount in stock, that would need to be ordered from Meyer by us. If your truck meets the above requirements, we would need a $1000 deposit to order the mount and schedule the install. We are currently booked for the next two weeks. I have a 2500 HD Crew cab short box. I currently have a Daniels Pull Plow (not installed) and would like to see if you would install the plow along with a 8 ' Lot Pro that I would purchase through you. I use my truck during the week and would like to know if it is possible to schedule an install over the weekend. It is best to email me back. The phones ring off the hook at the office this time of year. We can install the Daniels, but we too are very busy. I am booked all of this week, and all of next week. If it snows this weekend, we are going to be even more overbooked. We do not have any plows in stock, we would need to order the Lot Pro 8 for you. We only work a 1/2 day on Saturday, and just the Lot Pro alone is a full day to install. The pull plow will add probably another 1/2 day. This time of year is 90% repairs, and 10% installs, and the repairs come in daily. We are a small shop with only two of us doing the installs and repairs, and I am one of them, so I constantly get pulled away for other things. If I ordered a plow today it would be at least a week until it came in, and we need $2000 down before we order a plow, and we do not take deposits over the phone. I was wondering exactly how far out your work is. I have a E 46 that raised when it wasn't hooked to the chain on the blade. I replaced all the seals and this time the ram wont even lift up. Does this sound like the pump to you cause I can hear the motor come on. I wanted to know what it was so I can put it correctly in the box when I send it to you. If it is really an E-46 (no power angle) and you put all new seals in it, and the pump check valve is installed properly, then all it could be is the pump. It might be the pump relief valve that is bad, or the adjustment of it, or the pump could just be worn out. Pumps we are still doing almost daily. We have an install this week, and one next week, but we are still doing pumps as they come in almost every day. We are not behind really, but if we get snow, that will change. We are still fixing plows that broke last weekend. An E-46 is a pretty quick rebuild, due to the lack of a PA Block on it. Meyer does not make a plow to fit your Tacoma. They begin with the 2005 Tacoma. Message: I have an E-60 lift that has alot of wear on the lower pump mounting bolt. The pump doesn't sit straight anymore. Do you guys have a way of putting a bushing in there so I don't have to replace the whole pump base ??? No we do not. The base is cast aluminum, and adding a bushing not made out of aluminum would cause severe galvanic corrosion associated with dissimilar metals. In other words, it would cause it to rot off completely. You can put never seize or grease on it to help prevent further wear. I sent a Meyer E47 pump via UPS to have it rebuilt. The pump worked most of the time except when I needed it the most, usually when it gets really cold. I got tired of freezing my fingers trying to repair it every year. I can pay for the repairs with my wife's PayPal account. Please contact me if you have any questions. Your pump is done. It is a 1986 Model Year. The highest pressure we could get out of it is 1400psi. Spec is 1650 +/- 50psi. The motor is drawing 130 amps @1400psi. Reject amp draw is 230 amps, so you are way under. Average is around 190. Yours is low due to the lower than normal pump output pressure. 1400 is not bad, you probably didn't even notice it. It can be expected with a pump that is 24 years old. We replaced: The Crossover Valve, Filters, Pump Shaft Seal, A Coil & A Valve, and the Guide Bushing in the top cap. We also installed a Basic Seal Kit and Hardware Kit. All functions work properly. It passed the leak down test. It is ready to be shipped back. I will send a detailed invoice to this e mail address, followed by a Pay Pal invoice. It can ship back to you on Monday. Between the Holidays and the blizzard we got here, it took a little longer than expected to get it done. Hello, My name is E, i had brought down my e47 pump for repair. Its still not lifting the plow. I will call monday morning. Thanks! It sounds like you have a truckside problem. The pump worked perfectly on the test stand here. The test stand uses two 500# springs, so it is the same as lifting 1000# which is heavier than any plow Meyer makes. What controller do you have? Toggle switches? Slik Stik single lever controller (joystick)? Touchpad? Glad to hear you got it working. Plow on! Good day, just orderd my second set of seals for my ST angle ram because i screwed the first set up so bad!! What is the secret to puttin the seal in the nut ? We are waiting on 20 sets to come in. Sold the last set in stock earlier today. No real secret. Put the (wiper) seal in the nut, then put it on the shaft. Make sure there are no high spots around the bolt hole in the end of the shaft. Put a little grease on the shaft and slide it on. Tighten the nut by hand, and give it a little snug with a pipe wrench. Do NOT overtighten the nut or you will lock the ram in place. Only make the nut tight enough for the ram not to leak. Kudos to you for getting the nuts off in the first place. 99% of the time we shatter the nuts trying to get them loose. Message: Is your online part number 15682 base in stock and ready to ship? Yes, but I need to update the description because the last 12 we got from Meyer last week have no drain plug on the bottom. battery? Did you have it load tested? out, the amp draw is usually around 200 amps, depending on pump pressure. which is why it is not recommended. the battery is run down, the alternator cannot keep up with the load. tryin to get one more season but wat u gonna do. IF you have the small square touchpad, with buttons labeled U D L R, it could be the problem. The motor sticking on is a symptom of the old small square touchpad gone bad. Could be a bad motor solenoid, so try that first, because when it stuck on, it likely overheated anyway. does not offer key blanks that I know of. Can you get 7.5 TM and C moldboards. If so, how much, and what would be the time frame. We have several here, but they are WAY too far gone to even consider skinning. I am guessing you mean ST-7.5 and C-8's since you ordered the nose pieces for the ST's. Both ST & C were discontinued by Meyer in November 2009. The last price I had on a C-8 Moldboard only was $2200. The answer is the Facelift. You can replace a C with a Lot Pro. Not sure if you know it, but the ST is a STandard plow, meant for 1/2 ton trucks. They will get torn up on 3/4 ton trucks as you probably know. The Lot Pro comes in a 7.5 version too. It is a much better design, AND the Facelift Program is offering a 3 year warranty on the A Frame, Pivot Bar and Moldboard, and 5 years on all the welds. I just got (3) New C-8 "Weldments" from Meyer. These are the frames meant for CP (Poly) plows without the poly. The plan is to either skin them with steel welded to the frames, or bolt on a stainless steel skin. They are a spring project at this point, but I grabbed them because Meyer still had them in stock last month. I just checked inventory at Meyer and they have (18) CP-8 Moldboards in stock. The price is $1757 each. Not sure if you know, but the poly plows are built stronger than the steel plows. The two biggest benefits are the poly skin is removable, so you can repair or paint the frame if need be, and the snow dosn't stick. To give you an idea of strength, the C-8 steel moldboard weighs 333 pounds. The CP-8 (poly) weighs 408 pounds. That is because the poly is just a bolted on skin, and not part of the structure like the steel skins are. So the frame has a lot of extra steel on the poly. We just did repairs on two C-8's that are 9 years old, and they needed attention, but the owner plowed commercially with them for all 9 years and never replaced anything on them other than a hose here, and an angle ram there. Getting any plows right now will take some time. I ordered one last week and it is coming tomorrow, but, Meyer is closed the 23rd and 24th for Christmas, so that is going to put a ripple in shipping for a while. IF you wanted to do a few Facelifts, I can do better on the price too. The Lift Ram Packing is worn out. A Basic Seal Kit would be the fix you need. Contact Jerre, at Jerre's Service. He stocks Urethane edges. Message: My pump stopped working last yr and the dealer here said it was the motor. I replaced the motor and the ram still wont go up. Which rebuild kit do you recommend since I have a new motor? A Basic Seal Kit includes all you need to rebuild the pump. A Master Seal Kit also includes the Valve O Rings, and a Pump Shaft Seal. As far as not raising, the B Valve (Red wire) controls raise. I would pull out the B Valve and make sure it is not stuck. Remove the valve and use a small pocket screwdriver to press in on the hollow tip of the valve. There should be spring action on the tip that you can feel. IF it pops, and you free it up, consider replacing it. Once they stick it is a matter of time before it sticks again. If it is not stuck, check your wiring, and make sure it is getting power when the raise switch is pushed. If it is getting power, make sure it has magnetism using a screwdriver, you should feel the screwdriver pull to the coil when the switch is pressed. I replaced all the valves, A,B, and C, ran all new wire, put a motor on it, changed the fluid, checked the magnetism, used the test light to make sure power was getting to valves. None of which is fun, espeically when its pouring down snow and 25*. The last time I used it, which was bout 3 yrs ago, the ram was leaking down after a few hours with the plow on it. And I noticed air bubbles around the top of the pump where the ram is. I ve had it since 1987 and its never been rebuilt so I pretty sure its bout time. Having said all that, would the master seal kit be the one I likely need? With all new valves, all you should need is a Basic Seal Kit, unless you want to change the Pump Shaft Seal too. Message: I ordered a rebuilt kit form your company. My plow is moving slow in all directions , does this sound like the pump needs to be rebuilt to you , fluid level is good. Thank for your input. How cold is it there? What fluid are you using? A rebuild alone doesn't usually speed up a unit. Did you try cleaning the filters? Especially the one in the back, that is the high pressure filter that the fluid passes through after leaving the pump. Improper pump pressure will slow down all functions. A clogged screen will slow down all functions. Using ATF in the system will slow down all functions, especially the colder it gets. Moisture in the system will form ice crystals that will clog the screens, and slow down all functions. Thank you Chuck, I have cleaned the filters already , the fluid that is in it is the blue -50 meyers replacement hydro. oil. but all controls are still slow I have check all grounds and hot leads. it seams like it is getting slower. One other thing. IF it is an older E-60 with a single lug motor (no ground wire) you could have a problem with the motor. Does it pull a lot of power when it is going slow? The single lug motor grounds where it meets the Sump Base, and with the motor bolts. Corrosion is a common problem. Message: i have an e60h and need a new unit. can the new e58h hook up. any wiring issuses what do i need to do a swap out. thanks m.
You need a coupler kit. You need a wiring adapter. The E-58 does not come with couplers. It has two wire coils vs. the single wire coils on the E-60. No matter what is wrong with the E-60H it is cheaper to fix vs. the E-58H @ $1700 plus the couplers and adapters. The E-47 and E-57 use the same seals. The only difference is the pump shaft seal, (and the motor). So no, the E-47 Ultimate kit would be a waste for an E-57 in that you can't use the motor cap in the kit. The E-47 Basic Seal Kit fits both the E-47 and E-57. The Valve O Ring Kit fits both the E-47, and E-57. Message: Hello....I bought a truck with a Meyers plow on it and I am unsure of the exact model. I am in MN and as you may have heard we received 17" of snow! Well one of my hydraulic hoses took a "hit" and pinched coming right off the solenoid block and fitting. I only need one hose but if there is a kit for two I would consider that as well. All I know is I have a E-60 pump/lift and 2 rams on the plow for left/right and the blade reads "Meyer Max". I took pictures if I can email them to you? Or are the hoses all the same on just about every plow? The plow is from about 2002? The truck is a 2000 and I think he had the plow put on a few years later....Please let me know ASAP as we are expecting MORE snow later this week. You have an E-60 pump, and the plow is a poly. IF it is a 7.5', then it is likely an ST, and because it is poly, you add a P to it, so it is an STP-7.5. IF it is an 8' plow, then it is a C Series, and the model would be CP-8. The C Series has 4 trip springs. Both hoses are in stock. I have a Meyer E-45 pump that I need replaced. I heard that I can send my old one to you for a rebuilt one in return. I couldn't find E-45 listed on the website, so I thought I would drop you a line and see what my options are. I'm in Michigan and we just got hit with 2+ feet of snow in a day and a half. I need my plow! Please drop me a line as soon as you are able. Parts for the E-45 are VERY limited. We do not do exchanges. We do sell rebuilt pumps when we have them. Right now we have none available for sale. Your best bet is to upgrade to an E-47. ALL parts are available, and willl be for many years to come. Message: I need to make some orders but I want to make sure this is a legitimate business. I tried calling your phone number(9732097569) and it went to an automated message telling me to press a number to refill minutes or something so i was wondering if i could get a reply and possibly a working number to call and verify...also if u r certified by the BBB that would help a lot as well. Sorry to be a prick but I got screwed ordering over the web once. Thanks! -D.
Maybe your cell phone is in need of minutes? We have been here for 4 years as a Meyer Distributor. On eBay we have a feedback score of almost 600, we are Power Sellers, and Top Rated. I have the awards here on the wall. I shut off voice mail because I can barely handle the 50+ calls a day asking for help with broken plows, I could not find time to return calls, and that upset people. So now they are upset that they cannot get through, because I also shut off call waiting. As far as the BBB, NO WAY. They charge, and they charge AGAIN if you want it for the web. It would cost me over $700 a year. I OWN and operate www.LetsTalkSnow.com and 31 other truck and plow web sites. My reputation speaks for itself. I have written a dozen+ magazine articles for snow plowing magazines over the years. I have consulted on numerous snow plowing training videos for SIMA (Snow & Ice Management Association) and other entities. I sat on the Certified Snow Professional Board of Governors with SIMA for 3 years. I will tell you it is hard to get through here. I hang up, and the phone instantly rings again. So we made the online store www.SmithBrothersPlowParts.com so people could buy parts without having to call here. When I take a phone order I pay a higher processing fee for the credit card, and at the end of the month, I get hit with another fee that is a percentage based on the $ amount of the phone orders for the month, so I turn away phone orders as much as possible, and refer them to our online store. Message: My ground bolt is loose from the inside, how can I tighten? insulators are slid in with the studs. It will take a lot of careful prying. corrosion on the studs makes it difficult to tighten them too. So on the back of the switches the White wire gets jumped to 3 terminals. When we sell rebuilt E-60 units they go for between $650 and $750 depending on how many new parts we use. Right now, we have none available, but we have some here to rebuild for sale, just no time to get to them. New, they are obsolete, as in Meyer is not offering them new anymore. They have been replaced by the E-58H. The E-58H has a list price of $1700+. Some dealers are still sitting on old stock of the E-60, I see them listed for sale for around $1200. Message: Could you please tell me the rated horsepower of E-60 motor, installed a new one and it is pulling high amps, like 40 amps not connected to pump, and 120 raising plow. I do not know the horsepower rating. That is not provided by Meyer. I can say that sounds way low as max amp draw at full extension of the lift or angle rams is typically 190 amps. Reject is 230 amps. If you are only pulling 120 max, the pump pressure is likely set very low. Even the E-47 with smaller motor and lower pressure pulls 190 amps average at max extension. IF the coil tests good, replace the valve. IF it is an underhood electric unit, it is NOT a Meyer E-47. Sounds like a Barnes, or one of the ones Northern Tool sells. You mean this adapter I make? Meyer does not offer it yet, though I am told they are working on it. We make these here. accured to me that the PA block itself might be blocked. Is if possible to remove everything on it and flush the whole thing with cleaning fluid? Or will the valve cleaning do it? and cleaned the screens. could this be the oil is bypassing in the pump when it comes under strain? Would this be the pump or somthing else? Did you install a Meyer seal kit? Did you change the Lift Ram Packing Cup? the next "burst" of pressure when you hit the switch pushes it past the bad spot and it continues up. not ATF or regular oil. We do not pay more than $100 for a core pump. Yes we will get more rebuilds up in our store as they become available, but they usually sell in a couple of hours. We do not have a waiting list because rebuilds are fill ins this time of year in between rebuilding customer pumps and new plow installs. plow will not lower. All other controls work. getting power, or not magnetizing, or the A Valve is bad. Message: Hello Chuck, I have a problem. My idiotic brother disconected the wiring from my switches. I can not figure this out. Pulling massive brainfarts. Where could I find a wiring diagram to wire this up? What I have is a E-47 pump with a two toggle switch control system All wires are original colors so if that helps, great! To angle left the white must have power. To angle right the white and green must have power. The power gets jumped from one switch to the other. The white gets jumped to 3 terminals of the switches. i am unable to find a wire harness from my touch pad to a,b,c solenoids ( e-47 / e-57) is one available ? do you have a catalog . thanks c.d. We do not have a print catalog, we do have an online store. Thank you for the quick response, I will be sending it over asap. Meanwhile my old one isn't working now. Problem: The plow won't move at all. When I toggle the joy stick (+) up or right it will click at the Meyer 47 Pump each time. No clicking when toggled left or down. Is the electric motor locked up? Regarding the wiring is the following correct when toggled? There are 3 coils with a wire coming out of them with a male bullet connector on the pump. A - Black wire, only gets power to lower the plow. C - Green wire, only gets power to angle the plow right along with the motor. To go left, only the motor gets power, there is no valve for left. The motor works with the solenoid under the hood. It has a white wire going to it from the switches. IF you do not hear the motor solenoid under the hood clicking, it is not sending power to the motor. Start there. It must be mounted on metal so the base of it is grounded or it will not work. Your valves are getting power when they should because you can hear them click. The large black wire on the back of the pump is ground, and it should be run to the battery negative terminal, not the vehicle frame, engine, or anywhere else for ground. Sounds like the motor solenoid under the hood is bad. "It must be mounted on metal so the base of it is grounded or it will not work." The Engine start solenoid isn't currently mounted. I Installed an over-sized battery 2-weeks ago, and had to move the engine start solenoid out of the way. I left it hanging loose. I will hook that up and try again. The ENGINE solenoid has a power and ground wire going to each of the TWO small posts on it. 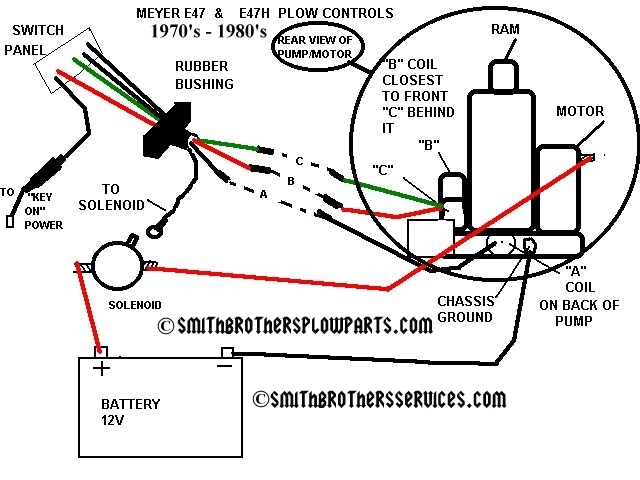 The Meyer plow motor solenoid only has one small post, with a power wire going to it, that gets power when the switches send it there, and it is always grounded through the base. Unless someone used a 2 post solenoid, and has one of the small posts grounded. I have just purchased a meyers Drive Pro 7�6� steel plow. I noticed that this drive pro mold board has holes on the side, as if this particular blade can take extension wings. Does Meyers themselves make the wings for this plow, or is there an after market wing for this. Anyway you can help me try and figure this out? Because I want to purchase the extension wings if they make them. Yes, Meyer has 3 different sets of wings available for the Lot Pro. A fixed 45� set, a multi-position set, and a fixed 90� set to turn the plow into a box. You can find all the available accessories for your Lot Pro on the Meyer web site. Some you can buy direct, some you cannot. All of them are shipped freight due to weight, so shipping is not cheap either. All 3 can be pinned on, or bolted on. They are very heavy wings to say the least. They are also not cheap as you can see. I had a customer run a set of the fixed 45� last season on his Lot Pro 7'6", and he loved them. We also had a very snowy winter, that ended with a 30" blizzard. Not one problem with the plow or wings. Thanks for getting back to me. I was inquiring about the Drive Pro, not the lot pro, sorry, my measurements could be wrong with which plow is which. I noticed that the Drive Pro 7�6� is 28 inches in height, as apposed to the lot pro with a 32 inch height. The drive pro that I have has the lateral holes in them as if there may be wings made for them, I am not sure if it has the same thickness of steel as the lot pro, but can the drive pro handle having wings on it? I have this on a 2010 Dodge 1500, with just a 2 inch leveling kit on front end. It really seems to hold the plow very well. If the drive pro can handle having wings on it, will that additional weight be to dangerous with adding wings? Sorry about so many questions with what should be simple for me to figure out. I would probably be interested in the 45 degree wings if I can get them for drive pro. My uncle and I are in business with lawn care and winter time snow plowing. With my new dodge, we had some problems getting the mount put onto the truck. We called all around and no one would give us any �phone advise�. But when he called your shop, one of the people there really took the time to explain what we needed to do. So any items like this, we are hoping to give you the business. That would have been me that spoke to your Uncle. No one else here fields those kind of calls. I get about 30 a day asking for advice. Sorry for the mistake, I ws trying to go through all the e mails from today and get replies out as quickly as possible, and I read Lot Pro even though it clearly says Drive Pro. Unfortunately, no wings are available for the Drive Pro. Glad a 2" kit worked for you. I have spoken to several Meyer Distributors who will NOT put a plow on a 2010 Dodge 1500. The mount sits way too low, and the bumper design prevents the mount from being installed at the proper height. Even on the 2010 2500 the bumper valence must be cut, or replaced with a Power Wagon one that is much shorter. When are these truck manufacturers going to really consider that so many owners will be mounting a plow on their truck? My educated guess is that wings will void your warranty with Meyer. If they could sell them, they would. I am guessing it is the weight more than anything. Adding the wings will likely exceed the front axle weight rating. Yes, on the E-47. For the E-57, E-58H and E-60, a non-digital (analog) controller will work, but the pump will make a bang sound each time you let go of the switch and the plow will jump a little to the left. This is because the motor is spinning sending fluid in whatever direction you are telling it to with the switch. When you let go of the Slik Stik or Toggle Switch Control (analog switches) the valve slams shut that you were using to divert the fluid to perform the function (right. left, up) and the motor has to wind down, and the fluid has no where to go except the default (which is to the right side angle ram) when no valves are open. So the plow goes left. This was more apparent with the E-60 than the E-47 and E-57. That said, the E-58H has a higher flow rate than the E-57 so it is more apparent. The E-60 came standard with the Touchpad (digital) controller. The new Pistol grip is a digital controller. What the digital controllers do is hold the valve you were using to perform whatever function (up, right, left) open for a half a second after you let go of the button to allow the plow to coast to a stop. So to recap., E-58H should have a Touchpad or Pistol Grip controller. Now, it gets better.... The 22690X Pistol Grip controller has ARM and ALM. ARM is Automatic Raise Mode, and ALM is Automatic Lower Mode. Press the ARM/ALM button, and the plow will automatically lower when the truck is put into Drive, and raise when the truck is put into reverse. Perfect for plowing parking lots. Angle the plow to one side, then just work the gear selector instead of both the plow controller and the gear shifter at the end of each pass. Press the ARM/ALM button again, and it is the opposite, put the truck in drive, the plow comes up, and put it in reverse and it goes down. This is great for backdragging out loading docks, or dead ends. Press the ARM/ALM button again ,and it turns it off. The trucks equipped with Touchpads can be upgraded to Pistol Grip controllers, as the Pistol Grip controllers come with a Touchpad harness adapter. ALSO, the Pistol Grip adapter for Touchpad Controller wiring harnesses has two wires coming out of it. One is Orange, and will automatically turn on the plow lights when the Pistol Grip Controller is turned on. So you can eliminate the Rocker switch for the plow lights. The other is a Blue wire that gets hooked up to the Reverse Light signal wire that makes the ARM.ALM work. I hope I answered your question. Message: Looking for the 20 pin connecter for the truck side of the plow controls. Just need the female end that bolts to the plow frame, don't need the whole wiring harness. You must be talking about an Xpress plow. There is no plug available, it is the whole harness. IF the little flip up door is torn off, or the platic plug housing is damaged, there is a repair kit for that. Unfortunately, there is no short repair pigtail for the plug itself. I am looking for a price to have you remove and replace a plow skin on a Meyer ST 7.5 plow. As I have read on your web site, I will remove the A-frame and cutting edge. I live in Northeasten Pennsylvania and will deliver the plow myself. What is the average turn around time on a job like this. I will paint the plow myself. Also, I would be interested in you primering the ribs before the new skin is welded on. Thanks in advance for your response and I look forward to doing business with you. I can be reached either at this email address or by calling me. We skin plows in April, May, and usually into June. This time of year we just cannot commit to projects. We are too busy installing plows, and rebuilding pumps. I have no idea what steel will cost in the spring, so I cannot tell you until then. Message: i have a E-47 pump will the slick stick package deal work on my pump with no modification? Yes, it will work with no modifications. Message: I am looking to paint my plow after I do some repairs. I would rather brush it on than use a spray can. Do you carry paint and primer in 1 qt cans? I never carried the yellow in quarts before, so I ordered a case of 4 last week, and sold them in a couple of days. So I ordered 2 more cases of 4. Should be in this week. Primer does not come in quarts, only spray cans. We usually use Rustoleum Rusty Metal Primer here in the shop. Message: I have an e 47 pump and it leaks down with the plow on it slowly. i put a new valve and coil in it and it still does it any ideas? some one told me to re sleeve it. does that come in the master rebuild kit? The Lift Ram Packing Cup is worn out. It comes in the Basic Seal Kit. Message: Hello Chuck, you sent me some information recently regarding a question about my ST-90 model snow plow. I was looking for seal kits and couplers and you hooked me up with the web pages showing your products. Thanks. I just wanted to confirm (before I order these parts from you, and I did download the Adobe owner's manual by the way, thanks) that the ST-90 model that I have does indeed have the E-47 model pump/motor. The manual is helpful in that it depicts images of what the E-47 and other models look like, but I still cannot confirm, for sure that this is my plow's pump/motor model. The numbers on the unit(s) are worn or deemed insignificant in helping me with my issue. I was hoping you could tell me if I do have the E-47 or possibly another model pump/motor unit. I can order the parts I need if I can be sure of the identity of the pump/motor. S in Colorado. ps I can just feel the snow a com'n. If you do have an ST-90, and the pump is as old as the plow, and it has power angle, it would be an E-47. It should have a large power wire going to the motor, and a large ground wire to the back of the unit. Then it will have 3 smaller wires, one black, one red (might be faded to pink or damn near white) and a green one. IF so, it is for sure an E-47. It sounds like your hoses are crossed. Message: I recently orderd parts for my jeep plow.The person I spoke with was telling me about wiring this up and there was a link or web site that could help.Would it be possible to send them to me. Here is a simple toggle switch control diagram I made years ago. The wire to the motor solenoid is white. The power supply wire under the dash was black for years, with a 20 amp inline fuse, and then they changed it to a blue wire with a 20 amp inline fuse. Message: I am rebuilding my old ST series plow for my Jeep. My moldbord is 6' will the ribs need to be cut to fit? How many cans of primer and paint will I need? My moldboard did not have the pivot tube washers. Do I need them? What gauge is the OEM skin? I know you don't sell skins, any suggestions on how to put the radius in the steel before I weld it in? Not sure what you mean about the ribs. ALL ST Series plows use the same ribs, the width of the blade makes no difference. How many cans of paint? I use about a quart of each. Brushing on is better than spraying in my opinion. You can build it up a lot thicker, and work the paint into places better with a brush. On a Jeep, you probably don't need the washers on the tubes, but if you are reskinning it, why not add the extra support? OEM skin is 12 gauge. You have a bad Sump Base. It could be a bad B Check Valve, but in my experience, it is a bad Sump Base. There is porosity in the casting allowing fluid past the B Valve. Did one here last about a month ago. The Sump base has the two filters in it, and the drain plug. You'd need a seal kit, and a Sump Base. You are looking at a $400 repair here. Not sure about elsewhere. Did you register your warranty 2 years ago? What pump, E-57H? If it was a complete new plow you bought it should be covered under warranty. Did you buy a complete new plow system? IF so, you have a standard 2 year warranty. IF you bought it used, no dice. There are 5 pumps here to be rebuilt now. We have an install coming in on Tuesday, and a Jeep in the parking lot to go over that was trailered here from upstate ny. The following week is a short week, (Thanksgiving) and we have an install scheduled for early that week too. The best I can tell you now is by the end of the month, but maybe sooner, and YES, it will not leave here until it is done right, and tested to prove it. You can drop it off if you like. The sooner it gets here the sooner we can get to it. We are open 9 - 5 during the week, and 9 - 1 on Saturdays. I have recently purchased a 1993 Chevy Cheyenne K2500, 4x4 pickup. I would like a snow plow, but am not intending to use it commercially, so am trying not to shell out too much. There is a Meyers snow plow I can get for $500. It is currently on a Ford F150 (not sure what year), but the guy who has it says he thinks it came off of a Chevy (he had to have something welded on to it to mount it onto the Ford. Here's the question: how can I, looking at the A-frame (which mounts to the truck) tell if it will (minus what was added to mount it to the Ford) fit my 1993 Chevy Cheyenne K2500? Mounts are vehicle specific. Modified mounts are usally not adaptable again. I say usually because with a welder and and time, a lot can be changed. We do not modify or fabricate mounts for liability reasons. There is three different mounts it could be. It could be old enough to be a Custom Classic, which leaves the vehicle specific lift frame permanently bolted to the vehicle frame, and the vehicle specific undercarriage bolted in place. It could be an EZ Classic, which has a removable universal lift frame, that is not vehicle specific. It has a frame mounted undercarriage (called a clevis frame) with two receiver tubes that the lift frame slides in to, and two clevises for the plow A frame to mount to. It could be an EZ Plus/MDII mount, where the whole assembly drops off the vehicle leaving only a universal clevis on the vehicle when the plow assembly is removed. My guess is an EZ Classic. IF that is the case, then all you would need to mount it to your Chevy is a mounting carton. That is $846. You can use the universal lift frame, plow pump, plow, and plow lights. Depending on which plow lights it has, you might need headlight adapters for your vehicle. If it has square Trucklites on it, then no adapters are necessary. If it has the rounded almost teardrop shaped Nite Saber lights, then adapters are required. If you decide to buy the plow, make sure you get EVERY part of it, including ALL the wiring. Message: How about the angle line couplers for a E47 unit?? Do you have an E-47 rebuilt pump? I have one that needs to be rebuilt (with a new motor). I was wondering if I sent you mine, would you give me credit and send me a rebuilt? Thanks in advance. We have no E-47's available, and none to rebuild for sale right now. We do not do exchanges. Customers send us their pumps, we rebuild them, and ship them back to the customer. I buy used units from time to time for $100, rebuild them, sandblast and paint them, and sell them. They all get new motors and all new valves and couplers. I have a meyers c-8 plow in need of reskinning and a e-47 pump that needs cleaning/flushing/repair. The moldboard is rusted through above the cutting edge and the ribs are seriously rusted as well. The pump will raise the plow only once or twice then no movement but you can hear the pump run. This past winter I cleanied the two coils on the side and flushed the main cyl. It got through the winter but that�s it. If I bring it to you for repairs should I disassemble the moldboard from black iron and pump frame from my truck and put in the bed? I�m not sure if the pump will hold pressure from Washington NJ to your shop. I know giving an estimate is unrealistic, but maybe you could give me a best case/ worst case senario. We only reskin plows in April and May. We do not take on projects in season. To reskin a C-8 it is $650, no paint. We prefer the moldboard only, no black iron on it. Often the pivot pins are seized, and that becomes part of the moldboard repair, along with repairing the center pivot hole and or replacing the welded in bushings on the sector and a frame too. Pumps we are accepting for rebuilding every day now. Left is default, there is no valve for angling left. If the motor runs and no valves open, the plow goes left. There is no combination of valves, each valve has one function. I am interested in being a dealer for your product in Calgary canada area. You want to contact Meyer Products. We are just a Distributor ourselves. Message: I have Meyer plow ST 7.5, and I want to purchase a pump for it. Which pump is the matching pump for it and how much does it cost? The ST-7.5 could have come with an E-47, E-57, or E-60 unit. NONE are available new from Meyer. They have all been discontinued. The replacement is the E-58H with a list price of over $1700. The answer is to buy a used or rebuilt E-47, E-57, or E-60 unit. The E-47 is the cheapest, and the E-60 is the most expensive. I have seen the E-47 sell for as low as $200 for a used one on eBay, to $650 for a rebuilt one on eBay. The E-60's go for as high as $800 rebuilt on eBay. We typically sell rebuilt E-47's for around $550, and E-60 units for around $650. It depends on how many new parts we put into them. ALL of our rebuilds get ALL new Coils and Valves, and NEW Motors. Right now we have no E-47's, the ones we have to rebuild are spoken for. We will have a couple of E-60 units rebuilt for sale towards the end of this week. First come first served. Hello, I've been looking at your older Meyer plow pumps and motors. I've recently purchased a used plow from a guy that told me the plow was an 1980's version. The plow is the ST-90 model and I was looking for a replacement seal kit for the pump/motor. According to your photos, the best match that I could make was the E-47 motor/pump (I can't find any significant numbers on my plow pump/motor unit)to confirm this. I also have not been able to find any downloadable service manuals. Does your company sale or do you know where I can find a replacement seal kit for this unit (provided I am correct in the model # (E47)? I am also looking for a hydraulic coupler replacement or two (my newly purchased unit leaks). Sorry there are no parts available for the T-5 or T-6 anymore. Can I send mine in to be rebuilt? And what is turn around time and cost? The cost is $250 plus parts. Other than a seal kit and fluid there is no way for me to tell you how much it is going to cost until we have it here and apart. A seal kit is $29.99 and fluid is $7.50. Right now turn around is about a week to 10 days. We are just hitting a little lull here before winter hits and it gets crazy. If what you are saying is, without the left module connected, your vehicle lights work properly, but with the left side module connected you only have vehicle high beams, then yes, the left side module is bad. It sounds like eliminating the right side module has no effect on the lights. IF the left side is bad, I suggest you replace the pair of them. Yes, the newer ones have internal replacable fuses, BUT, they also have a power wire that connects directly to the battery to supply power to the modules. The older ones pull power from the vehicle headlights. Your existing headlight adapters will plug right into the new modules. Your existing wire out to the plow lights will plug right into the new modules. The center plug that goes to the turn signals and parking lights, and ground will need to be spliced in, and that plug is the one with a nextra wire that goes directly to the battery from each module. Yes we do have them. I suggest you try and loosen the nut first before you buy the Packing Set. Often it is impossible to get the nut loose. I hope this is the right place to ask my question it seems you guys are the plow experts. As far as I know, you can replace the T-5 or T-6 with any other standard Meyer unit. An E-46 will be hard to find, as most want power angle. An E-47 will work fine too. Just be sure whatever you get is not an H (High Lift) model. 1987 - 1991 is the same. 1992 - 1998 is the same. Now, if it is an EZ Classic mount, there is a mount you can buy for the mid 90's truck, but it it $846. IF it is a Custom Classic mount, there is none for anything after 1991. For the record, an ST plow does not belong on a 3/4 ton truck, even if it was on one before. The ST is a Standard plow. The 3/4 ton should have a C Series plow on it. C= Commercial. That is a seal kit for a T-5 or T-6 pump. They are no longer available, and have not been for years. Message: i am interested in buying the night saber 2 lights but have a few questions does the M07550 kit come with a switch? and i was looking at the headlight adapter M07102, i have a 2001 Ford F-250 XL can you verify if this is the right adapter for this truck? also most everything on your site for the M07102 says that it is for the M07224 night saber 1 lights, i am assuming that it will still plug into the M07550 modules and the M07550 lights is that correct? Yes the kit includes a switch. The switch is in the Module carton in with the lights. M07102 is the correct headlight adapter. All the adapters say they are for the M07234 Nite Saber Lights, yes, but they Nite Saber II's are identical as far as wiring. The Nite Saber II's are in stock in case you are wondering that too.